Home US , women Make Your Own Doggie Belly Bands in 4 Steps! Make Your Own Doggie Belly Bands in 4 Steps! Your male dog is untrained, old or incontinent - your furniture and floors need protecting! Store-bought dog diapers and belly bands are expensive. 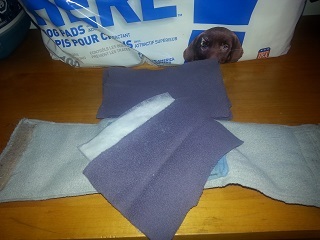 Let me tell you how to make some reusable doggie diapers/belly bands, to help keep everything dry. When we adopted Dexter, a little Bichon Frise we rescued through the city pound, they told us he had issues. Yes, he most certainly did! Abused, untrained and then abandoned to the street, he really needed a family to love him. We worked hard to potty-train him, but it just wasn't happening. No matter how many times a day we took him out, no matter how many times we danced and praised him, no matter what we tried - we came to accept he was incontinent. We still take him out every one to two hours to pee, but while he is in the house, he wears his homemade doggie diapers [belly bands]. At first I bought one reusable doggie diaper for $25 - which he hated and refused to wear. When I realized I had to come up with a better answer, I remembered all the cloth diapers I had made for my own children and set to work. I already had some polyester fleece and cotton flannelette on hand, so these belly bands cost me nothing but time. 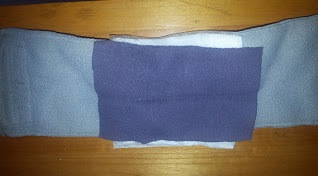 STEP ONE: For each belly band, I cut two rectangle strips of polyester fleece. I measured around Dexter's belly and added two inches (you might want three inches if your dog is a big dog) I made his band about 5 inches wide, but if you have a big dog you might need it as big as 9-10 inches wide. STEP TWO: For each belly band, I cut 4 square layers of flannelette fabric. So for Dexter, it measured about 5 inches square, for a bigger dog it could measure as big as 9 inches square. STEP THREE: I layered everything up, two layers of fleece, with the flannelette centered on top. I stitched around the outside edge of the fleece twice, and around the flannelette twice, turning under the raw edges. If you have a zig-zag stitch, you can do just one row over the raw edges, without turning it under. STEP FOUR: At one end of the fleece, I stitched on a strip of hook Velcro®. Then I flipped it over and sewed a strip of loop Velcro® at the other end. When I wrapped the diaper around Dexter, the two pieces of Velcro® would connect at the top of his back to hold the band secure around Dexter's belly. Because the diaper is made from fleece, these belly bands have a bit of give or stretch to provide a comfortable, yet snug fit. Originally I used 1/2 inch wide Velcro®, but it wasn't wide enough for a secure fit, so I added a second row of Velcro®. If you are buying Velcro®, I would suggest getting at least 1 inch wide. If you have a big dog, two inches or even three inches wide would be better. I found once I figured out how to make these, I could make them very quickly. We now have eight belly bands, and just toss them into the wash when they got wet. So my next idea was to cut up disposable pee pads into squares to go inside his belly bands - I cut them about 5 inches square to match the flannelette centers. If you have a big dog, just cut them bigger to fit the size of your belly bands. 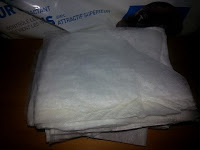 For Dexter, I got 16 small disposable pads out of one full-size pee pad (20-inch square). To protect Dexter's skin, I cut more squares out of thin polyester fleece, and layered as follows: belly band, then a disposable pad and then a fleece liner, next to his skin. Urine would go through the fleece liner, get soaked up by the disposable pad, which came with a plastic backing that kept the belly band dry. So I could simply toss the disposable square in the garbage, put the fleece liner in the wash and reuse the doggie diaper/belly band. This really cut down on my washing. TIP: Buy a large zippered mesh laundry bag at the local dollar store, and store your used fleece liners inside. On wash day, simply zip it up and toss in the washer. Before I started using that, we found fleece liners inside our clothing and my son even found one inside his uniform when he got to work! 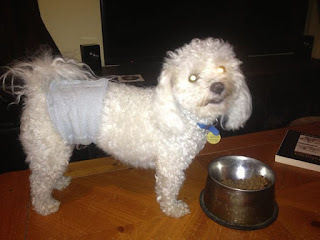 Position the belly band so the Velcro® is at your dog's back and the pad is under his belly. No one likes the frustration of puddles around their house. Both you and your dog will be happier and stress-free when you prevent accidents with your homemade reusable doggie diapers/belly bands. We use the cheap feminine napkins on our belly bands. Work perfect, and they don't get a rash because they are so absorbunt, very, very cheap! 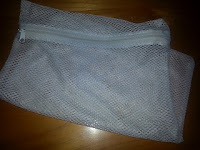 Great tip on using a mesh laundry bag to keep the pads from static cling-ing to other clothes! Great post!